India is the second largest food producer in the world after China. According to government estimates for the fiscal year 2015-16, the country’s total food market valued at US$39.71 billion and is projected to double in the next 10 years. Having successfully attained self-sufficiency in food, India benefits from marginal surplus in production, and is among the leading global producers of fruits and vegetables, milk, cereals, and wheat. Despite its strong agricultural production base, a significant amount of food produce gets wasted in India due to inadequate infrastructure such as packaging facilities, storage, transportation, cold chain, and low levels of processing. According to the Ministry of Food Processing Industry (MoFPI), post-harvest losses account for US$1.5 billion (Rs 92,000 crores) annually. Overall, less than 10 percent of the total food produced is processed into value added products in India. In comparison, the US and China process 65 percent and 23 percent of their produce, respectively. Similarly, other developing countries such as Thailand, Philippines, and Brazil process as high as 30, 78, and 70 percent of their produce, respectively. India’s vast agricultural resources alone creates huge potential for investments in its food processing and equipment industry. Major areas holding scope for value added processing are in the canning, packaging, dairy and food processing, frozen food, and thermo-processing industries. 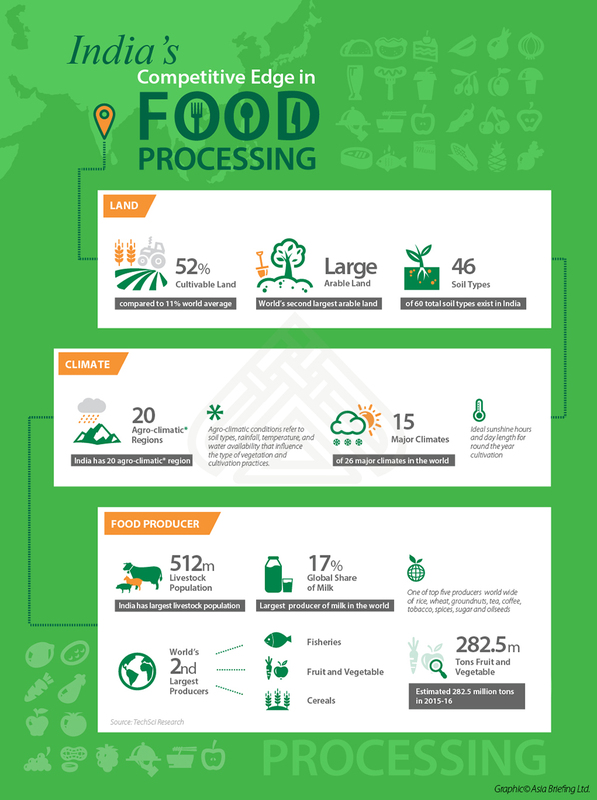 Currently, food processing accounts for almost one-third of the total food market in India. The food processing industry is valued at US$258 billion, and is the fifth largest industry domestically in terms of production, consumption, export, and expected growth in the country. It contributes to around 14 percent of manufacturing Gross Domestic Product (GDP) and 13 percent of India’s total food exports. According to a 2017 report by the Associated Chambers of Commerce and Industry of India (ASSOCHAM), the country’s food processing industry is expected to reach US$482 billion by 2020, driven by growth in organized retail, changing consumer behaviour, and increasing consumerism in tier II and tier III cities. Key players in India’s food processing industry are PepsiCo, Glaxo-SmithKline (GSK), Mapro Foods, Dabur, Parle, Nestlé, Frito-Lay, and Haldiram’s. 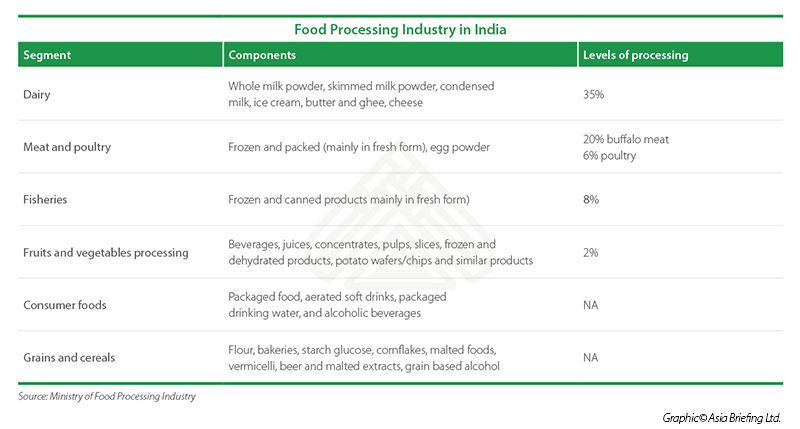 As in other countries, India’s food processing is categorized into six major segments as shown in the table below. Infrastructure bottlenecks: The export related infrastructure for agri-produce is grossly inadequate, especially at sea ports and airports. More than 30 percent of the produce from the fields gets spoilt due to poor post-harvesting facilities and lack of adequate storage infrastructure. With growing awareness, better health consciousness, need for convenience, and improving lifestyles, the share of processed food is gradually and steadily increasing on consumer plates across the world. In India, this change is bolstered by rising per capita income, a large young population (60 percent below 35 years of age), deeper retail penetration, and a growing number of nuclear families. India’s demands for processed food is, therefore, expected to increase to about 8.5 percent by the end of 2017. There is a rise in the demand for Indian processed food in the international market. In addition to changing consumer tastes in foreign markets, approximately 30,843,419 16 people of Indian origin live abroad (Ministry of External Affairs, India). 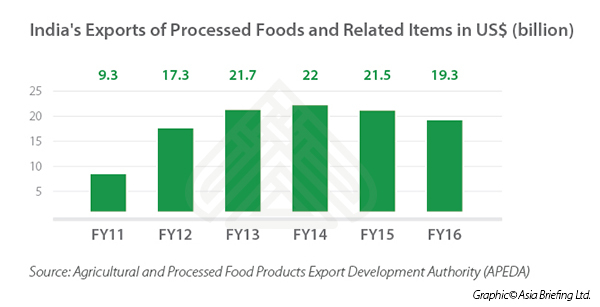 According to government’s estimates, Indian exports of processed food and related items rose at a compound annual growth rate (CAGR) of 11.74 percent during 2011-16, reaching US$16.2 billion. With India’s increased integration with the global economy and proximity to important foreign markets such as the Middle Eastern countries and Africa, the country’s food processing industry is also witnessing greater export potential. India has a relatively cheaper workforce that can be effectively utilized to set-up a low production base for the domestic and export market. 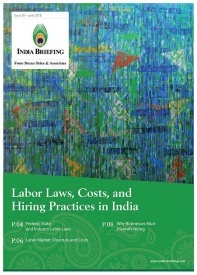 Production costs in India are lower by about 40 percent in comparison to most developed and developing countries. The government of India recognizes the need to encourage India’s food processing sector given the country’s immense potential. Accordingly, the Indian government has allocated nearly a billion dollars under the twelfth five-year plan (2012-17) to implement various schemes for the promotion and development of the food processing sector. Why do Onion Prices Cause Such a Stink in India? Under these schemes, financial assistance in the form of grants-in-aid is provided to entrepreneurs and state government agencies for the implementation of projects like mega food parks, cold chain management, research & development, quality assurance, and skill development. Foreign Direct Investment (FDI) policy: The government has permitted 100 percent FDI for trading through e-commerce and manufacturing of food products through automatic route. Further, FDI is now allowed in multi-brand food retail and India is looking to double food processing levels to 20 percent. According to the Department of Industrial Policies and Promotion (DIPP), the food processing industry has received around US$7.47 billion of FDI in the period April 2000 to December 2016. Fiscal benefits: The government offers several fiscal incentives to small and medium enterprises for setting up food processing facilities. 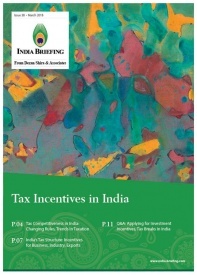 Some of these incentives include capital subsidies, tax rebates, and reduced customs and excise duties. Additionally, the government has constituted a fund of US$312 million (Rs 2000 crore) with the National Bank of Agriculture and Rural Development (NABARD) to provide concessional loans to mega food parks and units established therein. Increased focus on infrastructure: The government has established 60 fully equipped Agri-Export Zones (AEZs), in addition to 42 mega food parks and 128 cold chains, to boost agricultural and food processing exports. Under the 2016-17 Union Budget, the federal government allotted US$19.65 million for developing mega food processing parks. Moreover, in November 2016, the Food Safety and Standards Authority of India (FSSAI) launched a major scheme to upgrade food testing laboratories in India. Revamped national mission on food processing: The government is taking steps to launch a new scheme – SAMPADA or Scheme for Agro-Marine Processing and Development Of Agro-Processing Clusters by 2019-20. The overall mission will involve the launch of three separate schemes – creation and expansion of food processing and preservation capacities, new agro-processing clusters, and establishing backward and forward linkages. SAMPADA will have an outlay of US$935 million (Rs 6000 crores). I am living in Saudi Arabia and now want to set up my own business at ahmedabad .please guide me for new opportunity at Gujarat state.I am by qualification instrument engineer 20 years industries experience. There is immense opportunities for #entrepreneurship in #foodprocessing sector – dairy, bakery, fruit, juice, packaged, beverage, meat sectors. We “Gargson Properties Pvt. Ltd., Bhubaneswar, India” is interested to set up a Processed food Plant in the state of Odisha & is now looking for a Manufacturing Tie-up or Joint venture with existing brand owner or Business Player. Hello. Thank you for your query. Our service team will be sending you a mail shortly. We have a plot of 2.5 acres at Malavan, we would like to setup a Multiple Food processing unit at Malvan. If you are providing proper guidance and consultant services for the setup of the same then plz revert us on 9702130927. Dear Kaushik, thank you for reaching out to us. One of our associates will be in touch with you shortly. @Rajesh, thank you for getting in touch with us. One of our service providers will contact you shortly. We are a small scale company in manufacturing sector (Plastic Packaging) based in Aurangabad (maharashtra). We are thinking of diversifying in food processing sector. We are looking for projects that will utilize local produce. We are open to tie up with foreign investors or technology partners. @anilmirashi For information and support, please reach out to our services team: https://www.dezshira.com/office/india. I am working on setting up a Dairy project in Maharashtra and am scouting for investors. Please connect on gulzarwangde(at)gmail(dot)come or call/WhatsApp at 7387017525.